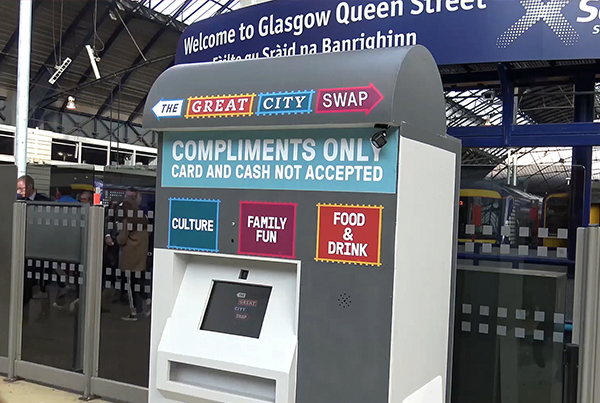 Our pals at Wire commissioned us to produce the tech behind Scotrail’s Flatterbox, a voice-controlled ticket booth which would give prizes to commuters in exchange for compliments. We developed a bespoke system that allowed comedians hiding inside the booth to hear what was being said outside and to reply to users via the ticket booth speaker. Our system also had a number of cameras, allowing the comedian to see who was there and allowing us to record the action. To add to the realism, we added ticket printing sound effects and an illuminated ticket slot that flashed when a prize ticket was dispensed. The machines – which ran simultaneously in Glasgow and Edinburgh for a week – were a big hit with the public and generated tons of coverage in the press and on social media.